Slumber party activities for kids can go beyond commercial tie-ins and junk food. Here are activities and themes for sleep-overs that engage kids' desire to create, explore, discover, or experience something new and different. Remember candy necklaces? Let kids make an edible breakfast necklace as one of their slumber party activities. In the evening, have kids string dry cereal pieces that have openings, such as Fruit Loops, Cheerios, or health food store versions of these cereals. They string them like beads onto thin elastic thread and an adult ties the ends together. Put each necklace into a baggie labeled with the child’s name and deliver them early in the morning. Avoid stronger beading string for safety, you actually DO want something that would break if tugged on too strongly, and give them to kids in the morning when they’re awake and active to avoid choking when they're sleepy or rolling over and crumbling them. That first slumber party is a little scary. But not as scary if you’re the "parent" comforting someone who’s even more scared than you. Turn a first slumber party for young kids into their Teddy bear’s (or doll’s) first slumber party. Each brings a bear who’s never been away from home at night. Cut fleece cloth ahead of time into Teddy bear blanket size and let the kids decorate blankets (fabric markers) to tuck the bears in at night. They'll take the blanket home as a party favor. Let the kids set up a finger food dinner for themselves and the bears, dress them in pajamas, let them watch a movie with them, and wake them the next day to sit around the breakfast table together. 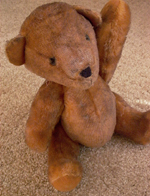 If you know for certain upfront that any child doesn't have a bear, find one at a second-hand store ahead of time and clean it well. Most kids have watched the classic Rudolph the Red-Nosed Reindeer movie which introduced the Island of Misfit Toys. Let the new recipient know the bear is from that Island, and is looking for a forever home with a new owner, and the child has been chosen for that purpose. Let him or her take home the bear with the child's parent's permission. Better to not offer a fancy brand new one. A used one just like all the other kids' bears would fit in better. The children’s section of your public library has kids’ books with visuals on how to make blank journals or scrapbooks. Choose one and hold a journal or scrapbook making workshop with the kids, providing all the materials. Set aside time for writing in their journals, or take digital photos, print them out, and provide paper glue so kids can affix the very first photos into their new scrapbooks. For something a little easier, Oriental Trading Company sells blank canvas covered journals in bulk that kids can decorate with fabric markers or stickers. You provide the cool craft materials or car models and instructions, and let kids make whatever craft you’re comfortable with teaching: salt-dough beads (you fire them in the oven while they sleep), kites, decorated drinking mugs (white mugs and glass or ceramic paint), doll clothes, toy parachutes for plastic action figures (be sure to test this one to make sure you have the weight right so it will work), bath bombs, and so on. Kids can make a simple piñata from a large blown-up balloon during the first day and evening. They can break it open in the morning after it’s dried and you’ve inserted trinkets. Pinata instructions are ample online and at libraries. If you think you'll be doing lots of kids' slumber parties or longer parties, you may be interested in our article on creative treasure hunts. And other activities within the Great Group Activities site.